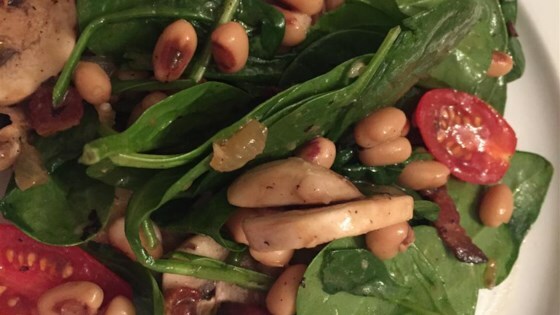 "This spinach salad with black-eyed peas is a twist on one of my favorite culinary traditions: serving beans and greens on New Year's Day. Greens represent paper money and beans symbolize coins. Here I present these ingredients in salad form, which is a great delivery system for hot bacon dressing." excellent, will use less sugar next time. Gawd, I loved this Chef John! I've made hot bacon dressing for years, but yours is the best! Loved this recipe. I added hard-boiled eggs instead of black-eyed peas. This was wonderful. You can't go wrong with Chef John's recipes. I love just about everything he makes. I did not cook the onion and used a sweet Vidalia onion - perfect dressing - tastes like the one my grandmother made! This was my first foray into warm bacon dressing! So good! I don't even care for black-eyed peas but they were great in this dish.